River Bhote Koshi (Grade 4 to 5) is a day run of pure adventure. A day rafting can fulfill your zeal to drift with in the the river Bhote Koshi. The rafting site is located about two hours and thirty minutes drive from Kathmandu. Twenty-six kilometers of continuous white cold water from himalayas soaks rafters as they shoot through a veritable maze of canyons and boulders. The rapids are steep and continuous class 4, with a lot of continuous class 3 in between. It is the steepest river rafted in Nepal and required a lot of concentration. Starting above Barabise, we will raft down to the dam at Lamosangu. There are also some fixed campsites ranging from safari tents to deluxe tents. A dinner with local fish from the rivers along some local wines would just add more flavour to your adventure story. Drive from Kathmandu to Khadichaur, your day rafting starting point. Guides will prepare the rafts and kayaks - your hand will be required. Get set and pay attention to our guides' briefing about paddling and safety measures. Experience the adrenaline rushes provided by the challenging class V rapids "Frog on the Blinder", "Midnight Express" and numerous class IV rapids. "Wall" and "Cave" are also encountered. The scenery of the different mountains, forests and ethnic Nepali cultural life. After rafting of 26km, we will stop for lunch and relax in the riverside for a while and drive back to Kathmandu after this thrilling experience for a well-deserved rest . to Kathmandu by same bus, All the equipments, guide, lunch and some light snacks, etc. 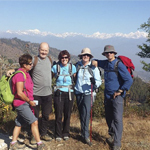 A day cycling tour that last about 6 hours and refresh you with Countryside, culture, heritage and off-road adventure near Kathmandu, Nepal..
Chisapani hiking is one of the most beautiful and closest hike to Kathmandu which can be done within a day. .. If you are a motorbike enthusiast then Nepal is the dreamland for you. Nepal is the country where there are more motorcycles then any other vehicles. ..